Pop quiz: When do most diaper blowouts or epic spills happen? Yep, you know it all too well… the answer is D. But here’s some awesome news. Now, there’s no need to scrub a stained onesie in a restaurant bathroom sink or strategically roll up dirty clothes in your diaper bag and hope for the best. Wash.It.Later is a simple solution that’ll save outfits and your sanity when a mess strikes on-the-go. Created by a mom, these liquid tight “soak & save” bags take the ick factor (and the stains… and the smells!) out of your kiddo’s messiest mishap. Each recyclable bag contains a single, all natural, hypoallergenic soaking pod. Simply add water and the dirty clothes, seal it up, and you’re good to go. What goes in the bag stays in the bag (the seal is super tight you’ll need scissors to open it at home). Better yet, it gets right to work on removing tough stains so that cute outfit can get back in the rotation, ASAP. 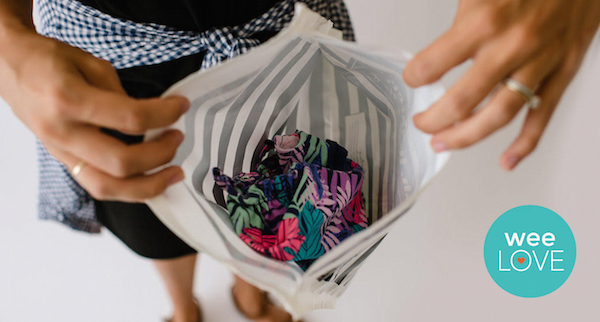 We’ve even been known to take a few of these on business trips in case our favorite blouse or comfiest skirt gets in the way of a spill—soak it and you’re good to go! From airplanes to restaurants, strollers to hotel rooms, thanks to these genius bags, you can seal the deal… anywhere. Be sure to enter code weespring20 to get 20% off your order (on Amazon or washitlater.com)!